...Wilden Pumps & Agriculture Solar Powered Pump Power Increases Efficiency, Lowers Costs and Maintenance. We offer tailor-made solutions that work with you to create energy cost savings. Wilden Pumps and Agriculture Solar offer a variety of pumping products for the agriculture market. Our application engineers will help select equipment for you specific application. As a licensed contractor, we can supply onsite repair and replacement services. Wilden specializes in air-operated double-diaphragm pumps. 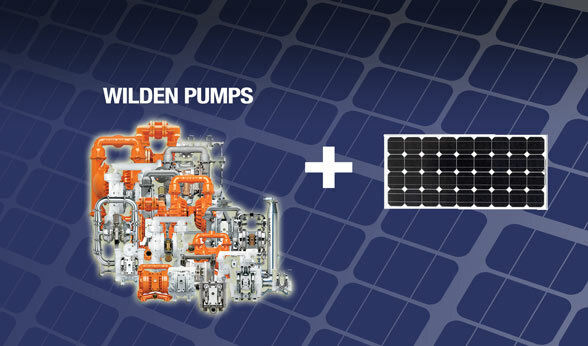 The development of new technology and ever changing market dynamics allows Wilden Pumps and Agriculture Solar to solve today’s toughest applications with their superior design. With Wilden Pumps and Agriculture Solar continuing mission to pioneer new technology and continuously evaluate and keep in the forefront of the ever-changing market dynamics within the industry, Wilden has the unique ability to solve tough pumping applications and increase efficiency with the most cost-effective, energy-efficient pumps possible. Our knowledge base combined with innovative new technologies and customer service will result in confidence when selecting a trustworthy process-solution partner. At Agriculture Solar, Wilden Pumps and Agriculture Energies can be your simple water pump solution. Wilden has been manufacturing pumps since 1955. Wilden pumps successfully delivers a broad range of flow rates and outlet pressures ideal for pumping. Wilden pumps are long-lasting. Agriculture Energies systems have been dedicated to modern agricultural irrigation and successfully active in the top irrigation fields for over 10 years and continues to bring the tried and true principles and advantages of solar hybrid power. Think about it, and then make your move. Let Wilden Pumps and Agriculture Solar water management provide you with decades of reliability and lasting value. We invite you to explore the possibilities of our reliable hybrid solar powered pump solutions. Our focus: by reducing the energy costs on water pumping systems, we all play an important part in conserving resources and making farmers more competitive on local and global agricultural markets. We all have a responsibility to use proven technology in innovative ways in order to support a growing and fast-changing ag world. We understand the impact of common sense and good business. Pay for just the power.